NextGEN Gallery is a very powerful plugin for WordPress that can manage the photo easily. It has many features and provides multiple language support. I've just made the Simplified Chinese language pack for the current version. This notice appears in [Add Gallery / Images] -> [Upload a Zip-file] and similar pages. Well, in fact, there are two more bugs if you really want to fix... Open this file [NextGEN plugin folder]/admin/tinymce/window.php and find out line 29-30. Replace them with following code: Checkout what I did (very simple) with this wonderful plugin and know more about how to use it. 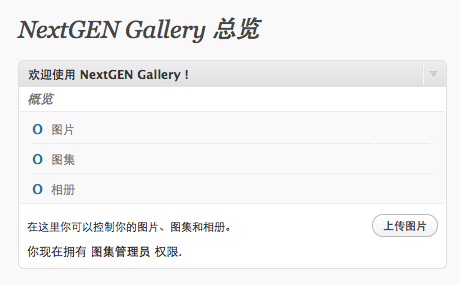 There are 113 responses to “Simplified Chinese Language Pack for NextGEN Gallery”. i`d like to try it! Hello, 由于NextGen已经换了主人, 从2.0版开始, 全部架构已经改变, 已经不支持单独更新汉化包.